Pandan is a very local flavour that is often found in cakes, kuehs and even desserts. My mom even told me that she would add pandan leaves to curries as well so as to enhance the flavour. 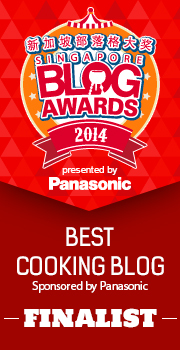 So you can see, it’s something that we can’t do without in most of our local cooking. And to the extent, I decide to grow my own pandan plant as well since I am using it on such a frequent basis. Long term wise, this is definitely cost savings !! 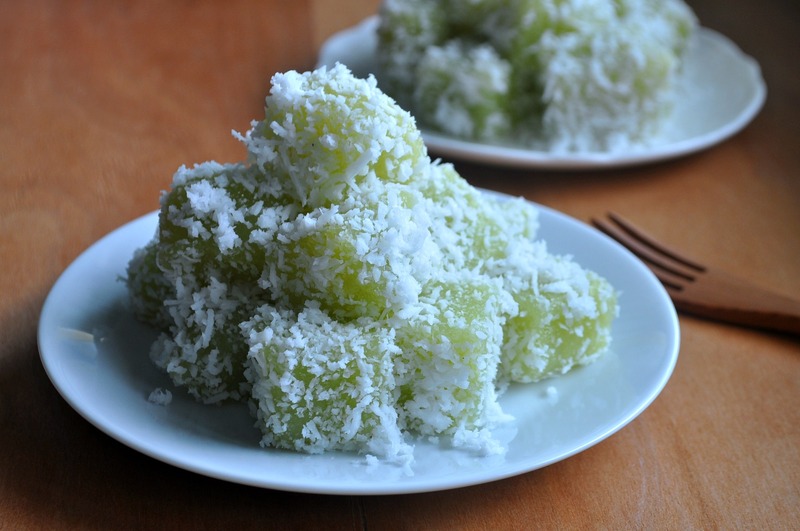 These Pandan Tapioca Kuehs are perhaps the best representation of the home grown plant that I have kept for sometime. Nothing beats making these tapioca kueh out of wholly natural pandan flavour. Plus the fact that the pandan leaves are home grown too, you can imagine how wholesome these kuehs turned out to be !! And using 100% pandan juice that’s extracted from the home grown plant, this is just as good as it can get !! Kuehs are very traditional kind of desserts to me, because they are often infused with coconut milk and sugar and hence made perfect for someone with a sweet tooth like myself. 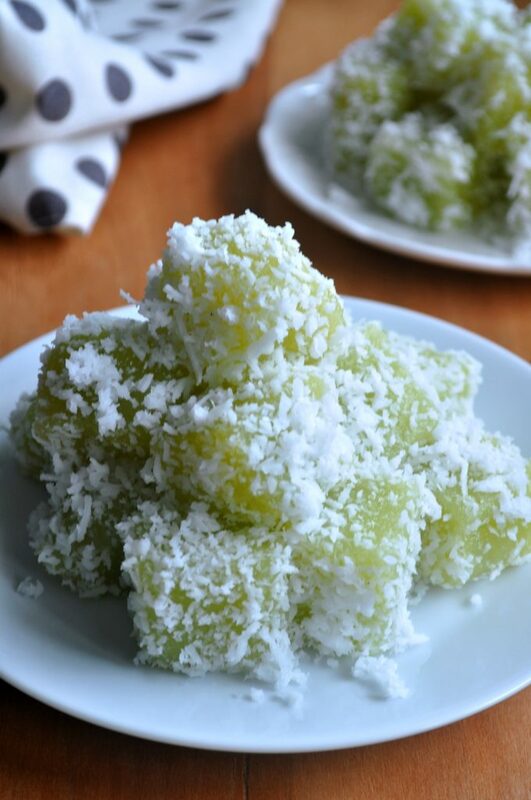 Commonly coated with fresh grated or shredded coconut, which is also one of my irresistible favourite whenever I am enjoying my kueh kueh party, this dessert definitely wins some wows from the family. 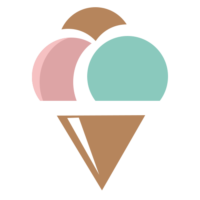 Hope you enjoyed this sweet treat as much as I do !! Cut the pandan leaves into smaller pieces. 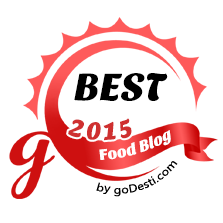 Add into a blender together with 12 tbsp of water. Drain the juice over a sieve to extract the pure pandan juice. Squeeze the blended pandan leaves to extract more juice till you can get around 100ml of it. Set aside. Mix the grated coconut with ¾ tsp salt. Place the grated coconut over a steaming tray and cover it with a cling wrap. Steam over high heat for around 5 minutes. Add the banana leaf into a 8 inch square tin. Apply some oil over it. This is to prevent the kueh from sticking onto it thereafter. Add the coconut milk, pandan juice, water and sugar into a small pot. Stir and cook over low heat till all the sugar has melted. Remove from flame. Add the grated tapioca into the coconut milk mixture. Stir and mix well till the batter becomes thick and starchy. Add the batter into the tin and spread it evenly to level it. Cover the tin with a cling wrap. Steam over medium high heat for 45 minutes till cooked. Remove from heat and allow the kueh to cool down for around 30 minutes before unmoulding. 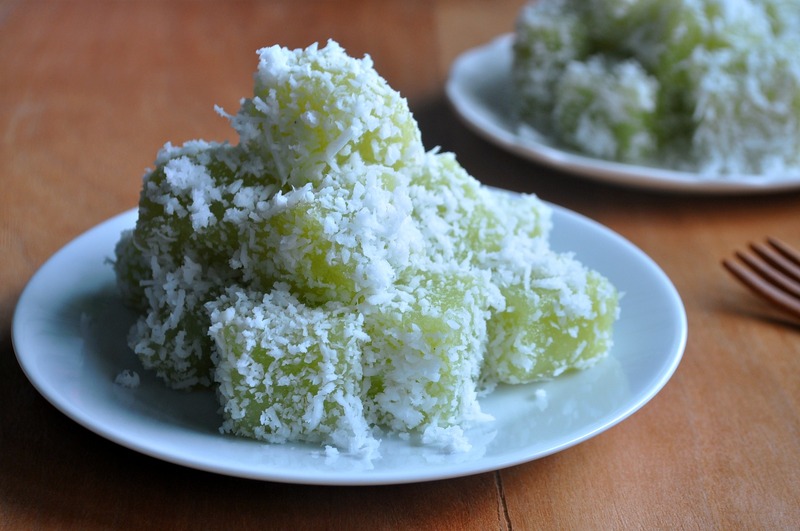 Cut the kueh into cubes using a cutter that's been oiled and coat with the grated coconut. Serve immediately. 1) The purpose of squeezing away the water from the grated tapioca is to remove the starchiness of it so that the texture of kuehs will be QQ and less rubbery. 2) Covering the tin with a cling wrap can prevent water vapour droplets from dropping into the kueh which would otherwise spoil the texture of it. 3) Fresh grated coconut spoils easily, hence steaming it with some salt can help to extend its shelf life slightly longer. 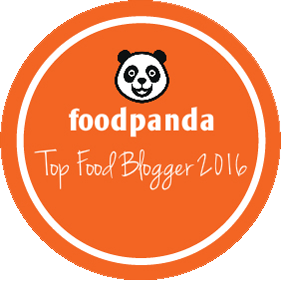 Thank you for sharing the Pandan Steamed Tapioca Kueh recipe. Your kueh looks very delicious. 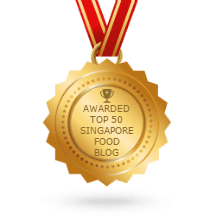 If I come across tapioca sold in Sheng Shiong supermarket in future, I will definitely buy it and try out your recipe. Thank you for the tips given in the Note. Hi Priscilla, Thanks for the compliments !! And hope you will enjoy this Pandan Tapioca Kueh too should you find chance to make them yourself ! Have a great day ahead !! 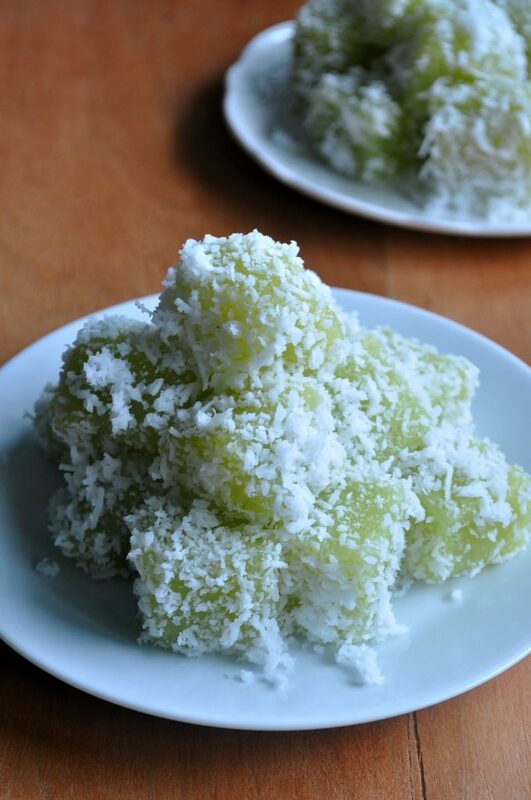 I love this lovely soft looking pandan tapioca kueh…very tempting! I’ve failed once baking a tapioca kueh and somehow unsuccessful, but will try this steamed type very soon. Tried out your recipe on this steamed pandan tapioca luge and I must say it is super delicious. This recipe is a keeper. Thank you very much.